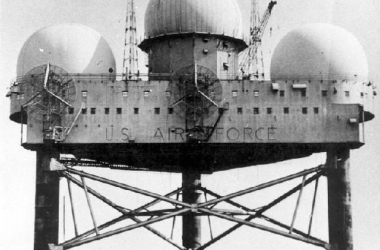 BEACH HAVEN — Imagine a wall of water more than 100 feet high slamming into the three-legged U.S. Air Force radar tower where you’re stationed 85 miles into the sea. The tale of the ill-fated Texas Tower 4 off the coast of New Jersey, which toppled in a nor’easter on Jan. 15, 1961 and cost 28 men their lives, has “all the elements of a great disaster at sea story,” diver Chuck Zimmaro said during a packed house presentation titled “Doomed Tower at Sea” on May 8 at the Museum of New Jersey Maritime History. 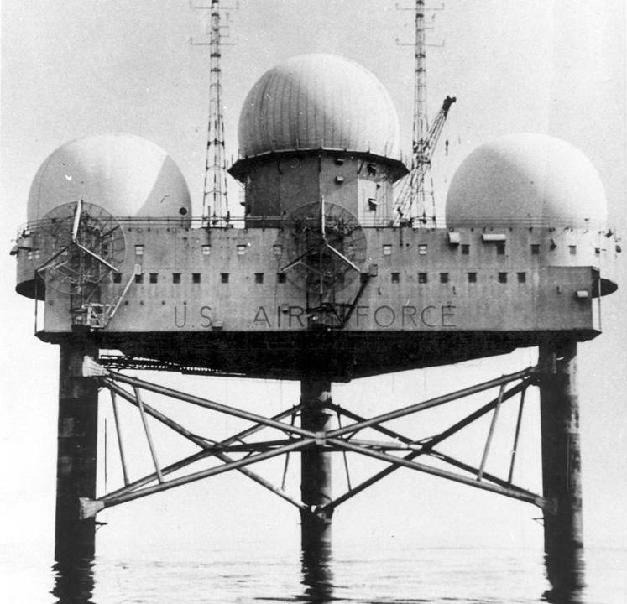 The Texas Towers, so named because they resembled oil rigs in the Gulf of Mexico, housed radar equipment in three rubber domes and extended the United States’ monitoring abilities almost 150 miles into the ocean, critical in case of a Soviet attack from the north or east. Zimmaro and Tom Roach, both divers since the 1960s, have descended almost 200 feet into the Atlantic Ocean to explore the remains of Texas Tower 4. In 2001, they lent their expertise to a History Channel special shot by famed underwater cinematographer Al Giddings. Joining the crew were Larry Phelan and Don Abbott, whose fathers perished when the tower sank. During dives taken while filming, divers were able to recover some artifacts from the wreck for Phelan and Abbott. Roach and Zimmaro’s presentation featured photos taken behind the scenes during filming and the History Channel special itself, which detailed the tower’s life from its construction to its collapse. Experts interviewed for the show, including University of California at Berkeley professor Robert Bea, concluded that poor design from the outset set the tower up to fail. Two sister towers were built off the coasts of Cape Cod and Nantucket but those towers’ legs were sunk 60 feet and 80 feet, respectively, into the bedrock at the ocean floor. By comparison, Texas Tower 4’s legs only reached 15 feet into the sand and had walls less than an inch thick, Zimmaro said. A few months prior to the nor’easter that sank the tower, Hurricane Donna tested — and severely damaged — the tower when it crossed directly over the tower in August 1960. The crew was not evacuated and had to weather the storm. “The tower shuddered and we all ran to grab our lifevests,” crew member Don Slutzky said in the documentary. In January 1961, the Air Force decided to shut down Tower 4 but the order was to be executed too late. The tower toppled between the decision and the date to remove the crew, Zimmaro said. The weekend that Tower 4 fell into the icy Atlantic, Capt. Sixto Mangual, who served as the captain of the Navy supply ship AKL-17 that serviced the tower, warned Phelan of impending ominous weather but Phelan’s superiors instructed him and his crew to stay. At 1 p.m. on Jan. 15, 1961, Phelan called his wife and said the tower was gyrating, Zimmaro said. The Air Force decided that the crew would be evacuated from the tower at 3 a.m. on Jan. 16, when it looked like the storm would break. An aircraft carrier and Mangual’s ship stayed in the vicinity. At 7:28 p.m., Mangual watched the radar blip representing Tower 4 disappear from his screen, Zimmaro said. Twenty-eight men, both airmen and civilians, perished. News of their death came to their families in the form of reporters’ questions before any official notice from the Air Force. 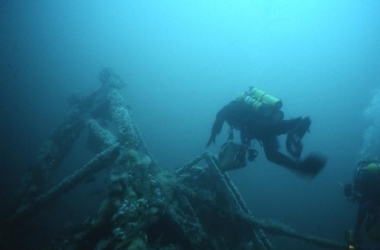 The wreck now serves as a watery cemetery for those who were lost at sea. 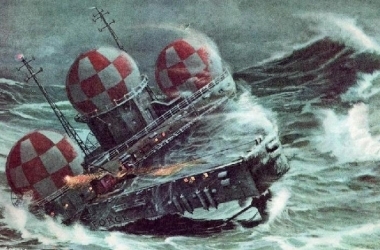 Mason said he was “amazed that such a venture was taken back then to protect from an attack.” Petkus said that she felt better choices could have changed the crew’s fate. “The decisions that were made were horrible,” she said.